Michael Pineda goes on the DL with a season-ending injury so “who ya gonna call”? Apparently the answer is CC Sabathia. 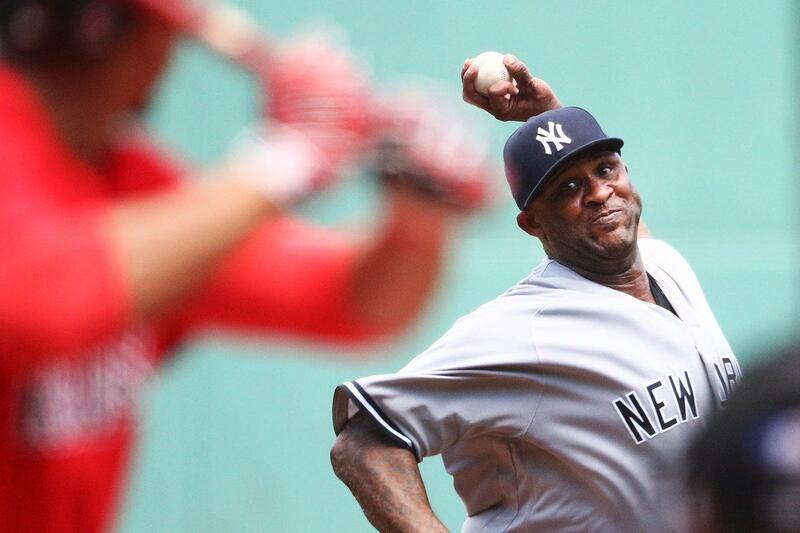 In the first game on Sunday, CC gave the Yankees exactly what they needed…six innings of scoreless two-hit ball. He blamed the five walks on rust, but he was otherwise very effective against the potent Red Sox lineup as the Yankees topped the Red Sox. Sabathia (8-3) walked the first two batters he faced in the game. A force out at second put runners at the corners with one out. But Sabathia was able to induce former Yankee Chris Young to hit into an inning-ending double play to keep the Red Sox off the board. 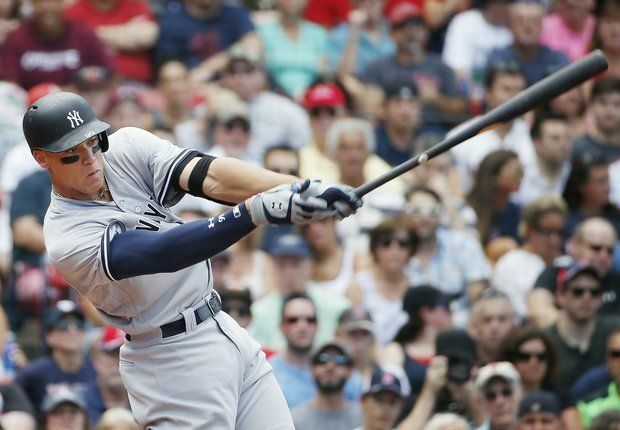 The Yankees were finally able to break through with the game’s first runs in the fourth inning against Sox starter Rick Porcello. Didi Gregorius lined a one-out single to right. Clint Frazier hit an infield grounder to shortstop Xander Bogaerts, but Bogaerts bobbled the ball for an error, allowing Frazier to reach first as Gregorius took second. Austin Romine singled to left, just past a diving Bogaerts, to load the bases. Ji-Man Choi hit a sharp fly ball to left fielder Andrew Benintendi, which scored Gregorius. Ronald Torreyes got all of a Porcello pitch with the barrel of his bat for a solid single to left, which brought Clint Frazier around to score in a close play at the plate. Brett Gardner took a pitch off the forearm to re-load the bases, but Chase Headley grounded out to first to end the inning. 2-0, Yankees. In the top of the 5th, Didi Gregorius lined a fly ball into the right field stands just fair of the Pesky Pole for a two-out solo home run as the Yankees increased their lead to 3-0. Aaron Judge finally got his first hit of the series in the 7th when he reached first base on an infield grounder against Red Sox reliever Austin Maddox. In the bottom of the 7th, Tyler Clippard (Yikes!) replaced CC Sabathia. Like Saturday, the first batter he faced (Brock Holt) singled to start the inning. Despite my Clippard-induced uneasiness, he retired the next three batters to get out of the inning. After the Yankees failed to score any runs in the top of the 8th with two men on base, the Red Sox brought the tying run to the plate in the bottom of the inning after Chad Green two-out walks to Mitch Moreland and Sam Travis. Fortunately, Jackie Bradley, Jr went down swinging as Green preserved the shutout. Manager Joe Girardi brought in Aroldis Chapman for the 9th, his third consecutive appearance in three days. Unlike Friday night, Chapman did his job, despite a two-out single by Dustin Pedroia, to earn his 9th save of the season. The Yankees (47-42) moved 2 1/2 games behind the Red Sox in the AL East with the win. Pending the outcome of the second game of the double-header, the Yankees also slid back into a second place tie with the Tampa Bay Rays. The Rays finally lost to the Los Angeles Angels, 4-3. In the nightcap, the Red Sox reversed Game 1’s score as they shut out the Yankees. It was the first time this season the Yankees have failed to score. The Yankees have generally fared well against Red Sox starter David Price but not on this night. Price scattered 7 hits over 8 scoreless innings and struck out 8. He did not walk a batter. Masahiro Tanaka (7-9) gave the Yanks length (he went 7 2/3 innings) but he was unable to match Price’s performance. In the bottom of the 3rd inning, the Red Sox broke their 24-inning scoreless streak when Christian Vazquez singled and Mookie Betts clobbered a Tanaka pitch over the Green Monster and out of Fenway Park for a 2-0 lead. Garrett Cooper picked his first Major League hit in the 5th inning when he lined a double to the wall in left. He was left stranded but it was good to see him finally have a productive at-bat. The Red Sox picked up another run in the bottom of the 6th. Mookie Betts led off with a liner that deflected off Masahiro Tanaka’s glove. On the run, Starlin Castro scooped it up and hurriedly threw a low throw to first baseman Garrett Cooper which Cooper was unable to handle. Betts, without hesitation, advanced to second. An error was charged to Castro. After Betts moved to third on a groundout by Andrew Benintendi, Dustin Pedroia hit a hard single into left field, just past Ronald Torreyes at third. Torreyes misread the velocity of the ball, otherwise, he could have moved into proper position to potentially get the runner at home. The run increased the Sox lead to 3-0. With Gary Sanchez on base in the eighth, Aaron Judge had a chance to make it a one-run game when he launched a high fly to the Bermuda Triangle in center. 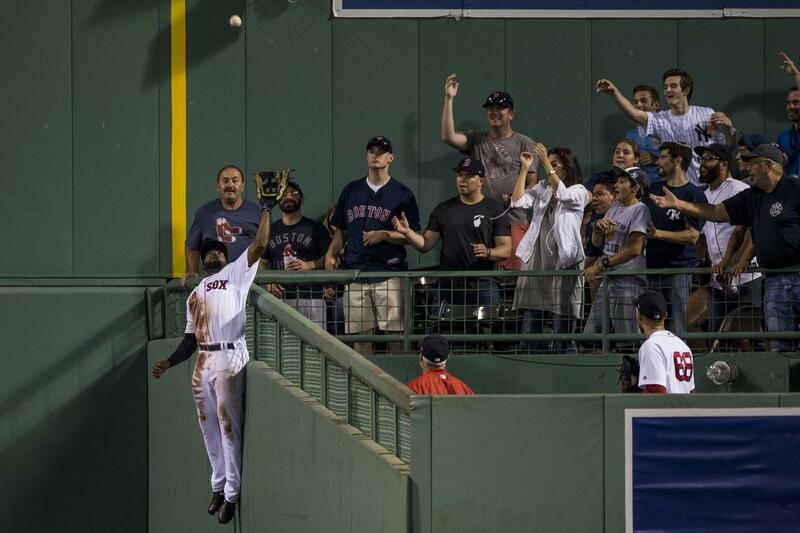 But Jackie Bradley, Jr made a leaping catch to snag the ball which would have landed in the Sox bullpen. “I thought it had a chance. But I just hit it to the wrong part of the park and the wrong centerfielder. Jackie’s been making plays like that for a long time,” Judge said after the game. The Yankees had a chance in the 9th against closer Craig Kimbrel. Didi Gregorius, 0-for-5 with 5 K’s lifetime against Kimbrel, ripped stand-up double off the left field wall. With two outs, Brett Gardner, pinch-hitting for Garrett Cooper, walked. It brought Chase Headley to the plate representing the tying run, but sadly, Headley struck out to end the game. 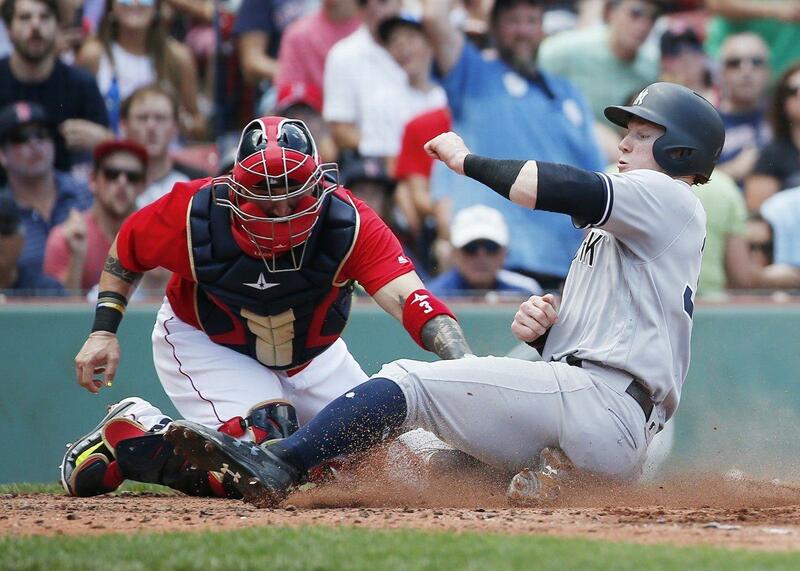 The Yankees (47-43) fell back into third place with the loss, 3 1/2 games behind the Red Sox. The Tampa Bay Rays are 1/2 game ahead of the Yanks. HR Derby Hangover: It was not a great series for Aaron Judge. He was 1-for-18 with 6 strikeouts and 3 walks. Hopefully the Land of 10,000 Lakes helps him get back on track. The Yankees will see one of their former starters this series when Bartolo Colon takes the mound on Wednesday for his first appearance as a Minnesota Twin. Aaron Judge and Gary Sanchez will be able to meet up with fellow Home Run Derby participant Miguel Sano. 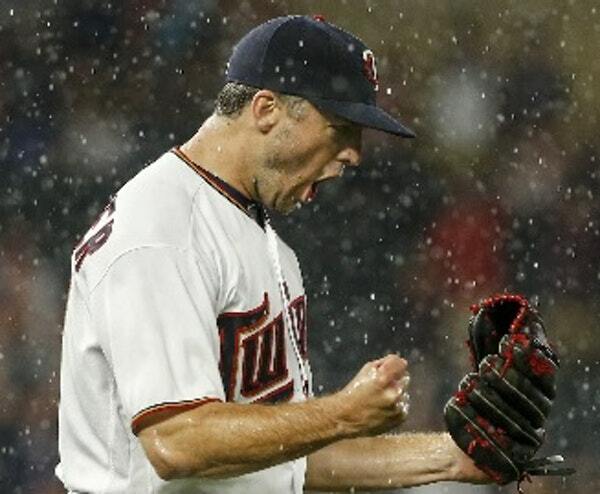 Like the Yankees, the Twins (46-45) started the season strong but have tailed off lately. Here are the scheduled pitching match-ups. Twins: Bartolo Colon (0-0, 0.00 ERA) — He was 2-8 with 8.14 ERA for the NL Braves. *Cessa is listed as the scheduled starter, but with Caleb Smith on the active roster, I wonder if Smith makes his MLB debut this game. Red Sox manager John Farrell said Boston will formally file a protest over the lack of an interference call in Saturday night’s 4-1 victory by the Yankees. In the 11th inning, Matt Holliday, forced out at second on an infield grounder to first base by Jacoby Ellsbury, raced back to first thinking that Ellsbury had been forced before the throw to second. His action prevented Red Sox first baseman Mitch Moreland from catching the relay from Xander Bogaerts and Ellsbury was ruled safe at first. Farrell felt that it should have been a double play on interference. The Yankees didn’t score in the inning so the net effect was inconsequential. I am not really sure what purpose the protest serves. It was clearly not an intentional act by Holliday as he thought that he was still in play. Upon completion of yesterday’s double-header, RHP Domingo German was optioned to Triple A. Bryan Mitchell, who served as the “26th man” for the double-header, was moved onto the 25-man roster and will start tonight’s game. Have a great Monday! Hopefully the Yankees will be right on target at Target Field. Let’s Go Yankees! In recent years, it has seemed as though no Yankee trade sneaks up on you. Even with Curtis Granderson, there were rumors swirling around before the deal was finally consummated. It has seemed like the press has been tapped into GM Brian Cashman’s inner thoughts. But admittedly, the Ichiro Suzuki trade surprised me. Years ago, this would have been a headline deal but it’s now obviously the acquisition of a former great player in the twilight of his career. In recent weeks, I had seen other owners in fantasy leagues start to drop Ichiro from their rosters. I had not been keeping up with his stats but I knew he was no longer the player he once was. But if anything, Derek Jeter has shown what goes down does not necessarily have to stay down. Some are suggested that Ichiro will be revitalized in the midst of a pennant race and the spotlight of New York. Maybe so, maybe not. But if you asked me if I prefer Ichiro in the outfield over DeWayne Wise or exposing Andruw Jones or Raul Ibanez to too much play, the answer would be, without hesitation, yes. I was a bit disappointed when I first heard the news of the trade as visions of Shane Victorino or Denard Span were dancing in my head. Yet, the realist in me knows that the cost to acquire either of those players would have exceeded the reward. On the other hand, Ichiro is simply a rental for the remainder of the season. He’ll be a free agent in the off-season so he’ll hand left field back to Brett Gardner when he departs the Stadium in October. 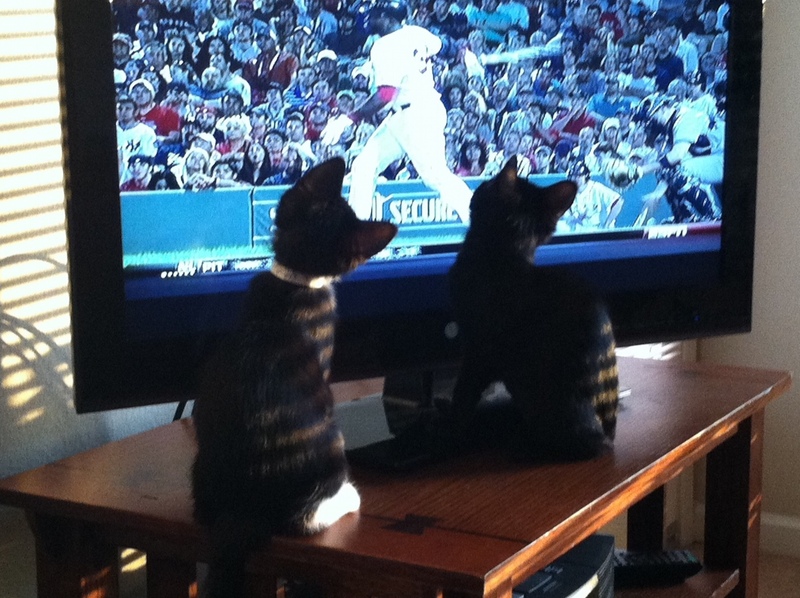 I remember the thrill of seeing my first game at Safeco Field. The player I was most interested in seeing was Ichiro and he did not disappoint. He came through with a few clutch hits and showed why he has been one of the better players over the past decade. The Yankees have missed a clutch bat so hopefully a revitalized Ichiro means that they’ll have the “pest” they need at the plate and on the base paths. I know that the pitchers the Yankees gave up were not top shelf talent (D.J. Mitchell and Danny Farquahar) but they have the chance to be good major league pitchers. I always hate to see good talent leave, especially if Ichiro’s days in pinstripes do not go beyond the next couple of months. I always remember how much I hated watching Jay Buhner punish the Yankees while wearing a Mariners uniform and wondering what could have been if the Yanks had held on to him. Now, with former top prospect Jesus Montero in Seattle, there are multiple players in the Great Northwest who could haunt their former team. The Mariners go for 20-something former Yankees while the Yankees go for almost 40-something ex-Mariners. I think the M’s have the better business formula even if it isn’t showing up in wins quite yet. 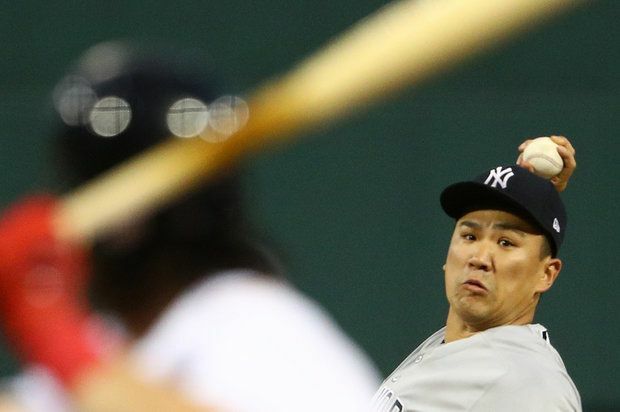 Now that I’ve gotten over the shock of the trade, I will admit that it is nice to see Ichiro in a Yankees uniform. It will be even better if he can get on base with consistency and make crossing home plate a common occurrence. If there’s one thing about the trade that struck me as unusual, it is the consummation of the deal prior to the start of the Yankees-Mariners series in Seattle. The trade guaranteed the Mariners fans would be subjected to watching the first three games of Ichiro’s post-Seattle career in an opposing uniform. Not any uniform but the most hated and despised uniform in most parts of the country outside of NYC. The Yankees apparently had conditions Ichiro had to agree to (batting in the bottom of the order, moving to left, and accepting an outfield rotation to get the bats of Jones and Ibanez into the lineup). So, perhaps the Yankees had the upper hand in this deal and argued that it had to happen sooner rather the later. For the Mariners, the motivation is clearly to move on and to further develop their further stars. After the Cliff Lee debacle when he went to the Texas Rangers for Justin Smoak after the Yankees thought they had acquired him, I really didn’t think the Yankees would forgive the Mariners and their general manager. But after the Michael Pineda and Ichiro deals, there is no evidence of hard feelings. Cliff Lee just wasn’t meant to be a Yankee. He proved that with his own decision to rebuke the team to re-sign with the Philadelphia Phillies. Lee is a good pitcher but some guys weren’t meant for Broadway. The question now is if the Yankees are done dealing before the trading deadline. 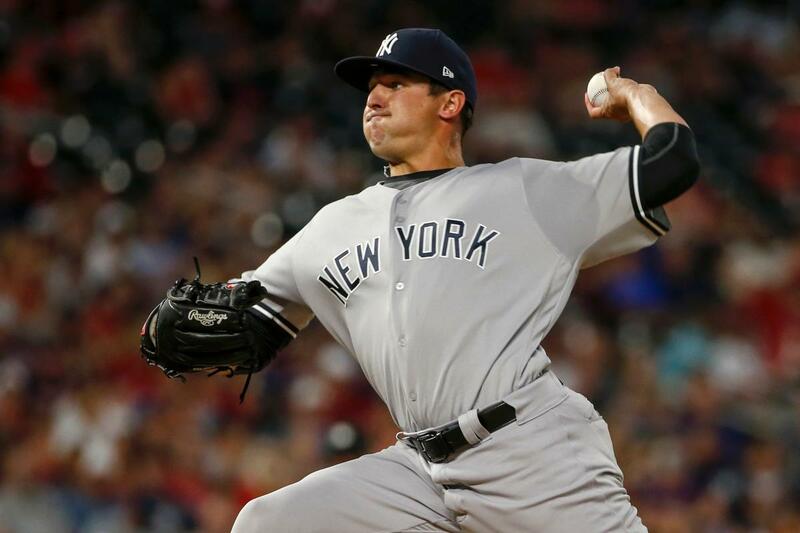 With the returns of Joba Chamberlain and Andy Pettitte looming on the horizon, perhaps they are the moves that can catapult the Yankees to the World Series. I can’t really think of another move the Yankees need to make other than further enhancing an already good bullpen. Sure, if the Philadelphia Phillies called to say that they’d trade Roy Halladay for Ivan Nova, you’d pull the trigger, but seriously, that’s not going to happen. After moving back to the Bay Area and living in what is described as A’s territory, it was really tough to see the Yankees swept in four games against the upstart A’s. While the Yankees hold a 7 game lead, the race is far from over. I still expect the Tampa Bay Rays to make a run, and of course, I am always fearful the Boston Red Sox make some major moves that propel them back into contention. I’d be foolish to underestimate Buck Showalter and the Baltimore Orioles. So, every day, Brian Cashman needs to be trying to find ways to improve the team. The nice thing is that I know he is. The next week should be fun as teams race against the trading deadline. Maybe it will be quiet, maybe not. I fully expect the Red Sox and in particular, GM Ben Cherington, to make a bold move. I respect Cubs pitcher Ryan Dempster for preferring to pitch for the Los Angeles Dodgers over the Atlanta Braves (I should qualify that by saying my favorite NL team is the Dodgers). The Tigers have been active as evidenced by their recent acquisitions of Anibal Sanchez and Omar Infante. I saw tonight that the Pittsburgh Pirates were close to acquiring Wandy Rodriguez, who has long been on the radar for both the Yanks and Red Sox. I almost missed the trade of Astros closer Brett Myers to the Chicago White Sox. I think the Sox have the market cornered on goatees. I am still missing Minneapolis but I am enjoying this baseball season. Life is good. P.S. Looking for some great photos? Check out Erik van den Ham’s website, http://www.panoramio.com/user/62613. Excellent!